Radon is an invisible, odorless gas that is a natural radioactive decay product of uranium, a common element in soil and rocks. Radon gas is considered harmless when dispersed in outdoor air but can be a serious health hazard when trapped in buildings. Radon gas can seep into a home from the soil through dirt crawlspaces, cracks in the foundation and walls, floor drains, pipes and sump pumps. Radon can enter any home, old or new, even those with no visible cracks. Each building is unique, and the ground beneath it is also unique. Two houses side-by-side can have totally different radon levels. The only way to know what the radon levels are inside your home is to measure them. Radon also can enter a home through the well water. If your water contains high levels of radon, the radon gas escapes into the household air when the water is running. 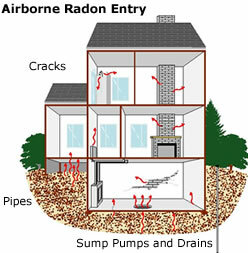 The EPA says, "The radon in your water supply poses an inhalation risk and an ingestion risk. Research has shown that your risk of lung cancer from breathing radon in air is much larger than your risk of stomach cancer from swallowing water with radon in it." AccuStar has put together additional information and links to help you to better understand radon. Radon in Your State allows you to select your location from the EPA's Radon Zone Map. The EPA provides Testing and Mitigation guidelines for the consumer. Other websites also offer helpful information about radon.